Emma Swanson has chosen to return to Western Australia. I think she’s been a great servant of our footy club, but equally I’d like to think we’ve played a big part in Emma developing as a footballer and a person in her time at the club. 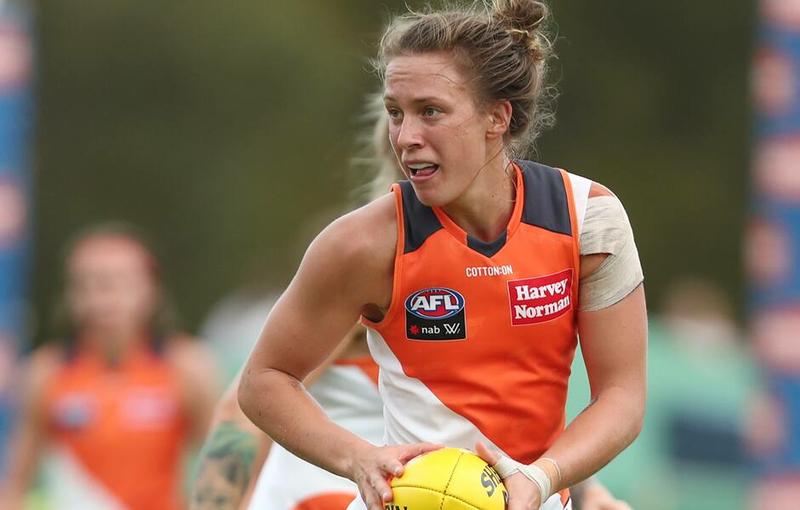 The GIANTS have farewelled two players as part of the 2019 AFL Women’s Sign and Trade Period. Defender Emma Swanson has signed with expansion side West Coast, while Phoebe Monahan has opted to join Richmond as an expansion signing. Swanson, recruited from East Fremantle, was one of the GIANTS’ marquee signings in 2016 and played 13 games in her three seasons at the club. The 24-year-old has chosen to return to Western Australia to be closer to family. “The support from the GIANTS staff and members, especially during my battles with injury, has been fantastic over the past three years,” Swanson said. “It’s a fantastic football club, one that is made special by the people within it." Swanson was part of the GIANTS’ leadership group and won the 2019 Coaches Award despite being limited to two games this season. Swanson suffered a nasty shoulder injury in the GIANTS’ round two clash with North Melbourne Tasmania Kangaroos at Drummoyne Oval that required surgery. GIANTS coach Alan McConnell thanked Swanson for her contribution to the club. “Emma came here as a marquee player in the first year and took a big risk in coming here,” he said. “I think she’s been a great servant of our footy club, but equally I’d like to think we’ve played a big part in Emma developing as a footballer and a person in her time at the club. Monahan was selected with pick 39 of the 2017 AFLW Draft from the UNSW-ES Bulldogs and played 10 games across two seasons with the GIANTS. “Phoebe came to us in year two of the competition, originally from Victoria but having most recently played in the Sydney competition,” McConnell said. The GIANTS will announce a number of key re-signings in the coming days which will put the club in a strong position ahead of the 2020 NAB AFL Women’s season. The first of two AFL Women’s Sign and Trade Periods runs from Monday, April 8 to Thursday, April 18.